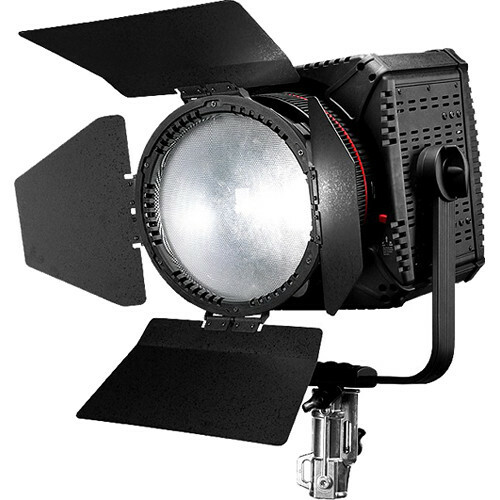 A smart choice for photography and videography, the CN-400F Daylight LED Fresnel from Nanguang employs a COB LED module to output 13,842 lumens of 5600K daylight-balanced light while drawing only 400 W and maintaining a high CRI/TLCI of 95/94, indicating an accurate color rendition. The CN-400F has an impressive spot-to-flood beam angle of 10 to 65° for wide coverage that can be further tweaked with the included barndoors, while the light features quiet passive cooling for sound-sensitive situations. The output is fully dimmable, locally on the fixture or remotely via DMX. The CN-400F is ready for worldwide use thanks to the inclusion of a 110 to 240 VAC power supply.